Selected models from the J D Neuhaus range of air operated hoists and trolleys are now available for clean room operations and other specialist applications that also require hygienic working conditions. These include chemical and pharmaceutical production establishments, together with the food and drink industries covering all aspects of both handling and manufacture. With a plating thickness of 25 µm, the hoists ensure resistance to environmental humidity as well as providing a good general corrosion resistance. The typical component parts of the hoist units that are subject to the nickel plating process include the lift/lower motor together with gearbox and the main centrepiece body. Where the hoist is trolley mounted for overhead rail operation, the trolley body and both driving and traverse motors are also nickel-plated. Further protective features also available include the provision of stainless steel options for the top suspension hook, both the load hook and sleeve, together with the lift/lower chain mechanisms and 12 metre capacity chain bag. Specification of the stainless steel hook and chain does limit the lift capacity to 750kg however. Further options include plastic chain boxes suitable for 3, 6 and 12 metre chain lengths together with a 12 metre galvanised chain box. A further positive aspect of the products is the fact that the lift motor does not require lubrication and all hoists are classified as explosion protected to comply with Directive 2014/34/EU [Equipment & Protective Systems Intended for use in Potentially Explosive areas (ATEX)]. 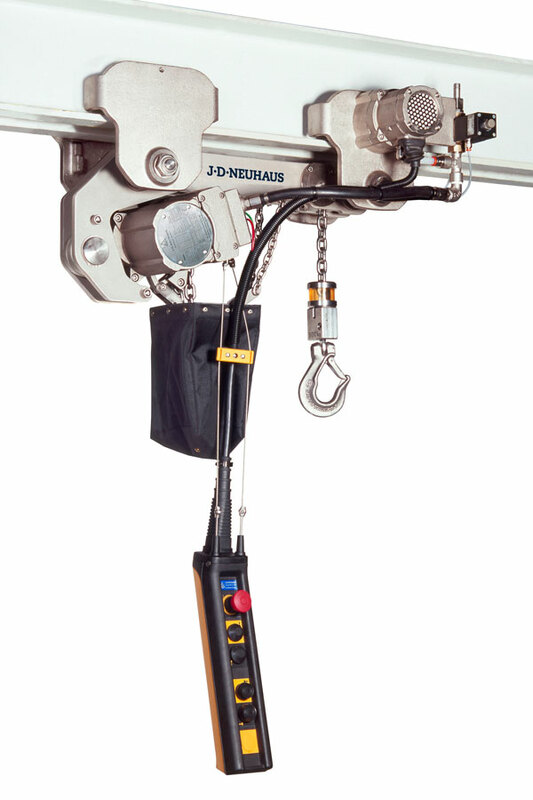 The hoists are also classified as capable of 100% duty rating with no downtimes.